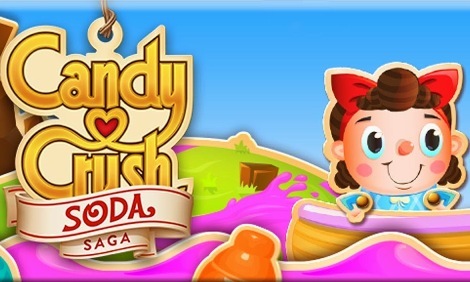 London, Nov 12 : The sequel of the mega hit puzzle Candy Crush Saga that was released on Facebook last month has now been finally launched on Android and iOS devices. The sequel, called Candy Crush Soda Saga, has a similar concept wherein the player is still in the "Candy Kingdom" where they need to match three or four candies in vertical or horizontal rows. There are five new levels in the game including the one where the player needs to fill a board with soda by matching new bottle icons and another including floating gummy bears. Washington, Aug 26 : The creator of Flappy Bird has pushed out an update to his new game Swing Copters to make it easier for gamers to play. According to CNET, on Monday, Nguyen came out with an update to tune the gameplay and make it far more accessible to players who, since its release Wednesday, have been trying to wrap their heads around a game designed around punishing failure. Following the changes introduced, the movements of the character in the follow up game to Flappy Bird is now more subtle, which gives players the chance to evade an early defeat. London, Aug 26 - American international company Amazon has bought a video-game streaming service Twitch for 970 million dollars. Google's Youtube was previously rumoured to indulge in the acquision for almost the same amount. Twitch, earlier known as Twitch. tv, allows gamers to watch other players play video games online. The service had over 55 million users until July this year, reported the BBC. Washington, Aug 19 : Flappy Bird creator Dong Nguyen is planning to launch sequel of the famous game, which would be called Swing Copters , this Tuesday. According to The Verge, The game will be free to play with a small advertisement, or users can pay a dollar to remove the ad. The creators have also released a video teaser of the game, which shows that instead of going forward like the previous Flappy Bird, this bird goes straight up with a copter-cap, while dodging barriers which looks like hanging hammers. Los Angeles: Britain`s Chancellor of the Exchequer George Osborne has revealed that the recently announced Star Wars spinoff will also be shot in the UK. The government minister recently visited the set of J J Abrams` "Star Wars: Episode VII" set in London, reportedly. "On set of Episode VII tonight, can announce another #StarWars film will be made in UK. A #LongTermEconomicPlan in a galaxy far far away," Osborne tweeted. New Delhi: Gaming enthusiasts in the country will finally get access to the latest Microsoft XBox One console, more than six months after the global launch, from September 23. While the gaming console will be priced at Rs 39,990 without Kinect, Microsoft will sell the device for Rs 45,990 with the Kinect sensor. "Every Xbox One system will include the Xbox One console, which features a 500 GB hard drive, Blu-ray player and built-in Wi-Fi, one Xbox One Wireless Controller and a free 14-day trial of Xbox Live Gold for new members," Microsoft said in a statement. Washington, June 4 : The makers of next-generation Batman game, ' Batman: Arkham Knight' have decided to delay the release until 2015. The game, which is the third in Rocksteady's trilogy of Arkham games, was originally slated to come to Xbox One, PlayStation 4 and PC in October of this year, Mashable reported. 'Batman: Arkham Knigh't puts Batman against the Scarecrow as he tries to turn all of Gotham into a quivering mess by releasing a fear gas into the whole city. Washington, May 15 - The creator of mobile gaming phenomenon Flappy Bird has revealed that the game will be making a return, potentially this August, in an updated version in which players will be able to compete with others in real time. The game, which was gone from mobile app stores since February 9, had topped both platforms' free charts and was overwhelming players and mainstream media outlets alike by early February. Washington, Apr 17 : Sony's PlayStation 4 console has reportedly hit another milestone passing the 7 million units sold worldwide nearly a month after the company announced that it had sold 6 million units. PlayStation 4 has reportedly been racking up sales steadily since its November launch, as it has reached 7 million units mark sold globally as of April 6. London, March 22 : Gone dead in February this year even as people were becoming real addictive to this gaming app, 'Flappy Bird' developer has announced its return 'soon'. The game's Vietnamese creator Nguyen Ha Dong has confirmed the free app would return but did not specify any date. 'Flappy Bird' was one of the most popular apps on Apple and Google App online stores before it vanished from the scene. Dong reportedly pulled the game for altruistic and personal reasons as he thought it was too addictive. Mumbai, Feb 12 : "Dhoom: 3 The Game", the official game launched in conjunction with Yash Raj Films' production "Dhoom: 3", has crossed the 10 million downloads mark since its release. While "Dhoom: 3" hit the screens Dec 20, 2013, "Dhoom: 3 The Game" was released exclusively for Windows Phone 8 Oct 25. Within just three days of its release, it was featured on the Windows Phone Store. The game is published by mobile game development studio 99Games under a multi-year, multi-title license from Yash Raj Films Private Limited. New Delhi, February 10 : A teenager has broken a Guinness World Record of getting the highest score on the popular game Angry Birds. Hecaterina Kinumi, who had previously broken a record after playing Final Fantasy X during 38 hours and 6 minutes, got a score of 36.000 points playing ' Angry Birds Poached Eggs 1-1', Visual Distinction Corporation reported. London, Jan 23 : A new version of classic computer game babe Lara Croft's latest adventure is set to be launched on "next gen" consoles. The makers are hoping to take Croft to a whole new level on the Xbox One and PS4 . Tomb Raider Definitive Edition will be out at the end of the month, the Daily Star reported. The new version boasts of a fluid 30 frames-per-second animation and never-before-seen detail. Washington, Jan 21 : Microsoft is reportedly secretly paying money to YouTube personalities for promoting its latest Xbox One gaming console. The software maker is believed to have paid out three dollars per thousand views to these personalities, including one popular games platform Machinima. According to PC World, a tweet from Machinima UK, which has been now deleted, displayed an image of Microsoft's gaming console and claimed to pay additional CPM bonus of 3 dollars for its promotion. Japan-based electronic maker and entertainment giant Sony on Wednesday announced a new game-streaming service called PlayStation Now, which runs on the company's PlayStation 4, PlayStation 3, and most 2014 model television sets. PlayStation Now allows its users to select a game from the list, let it load up on the device and then play it as normal. The image that the player views on the screen is actually being generated by a console that might be hundreds of miles away, rather than streamed to you live, like a film on Netflix. London, Jan 04 : Sony's PlayStation 4 has managed to sell around 160, 000 more gaming consoles than Britain's favorite Microsoft's Xbox One since its launch. According to Entertainment Retailers Association (ERA), the PS4 has sold a staggering 530,000 units since its November launch in the UK, the Daily Star reports. Xbox One managed to shift 364,000 consoles during the same period. U. S. videogame industry enjoyed a year-on-year increase of 7 per cent in total sales to $2.74 billion in November this year, fresh stats released by the NPD Group showed. Hardware sales jumped 58 per cent to $1.327 billion, while sales of accessories increased 17 per cent to settle at $327.4 million between 3rd and 30th of November. Hardware sales were mainly boosted by launches of new consoles. Liam Callahan, an analyst at NPD, said that November 2013 marked the best month ever for hardware sales. Respawn Entertainment used the recently held Spike TV VGX awards event to release a video clip providing new details about its eagerly anticipated first-person shooter - Titanfall. The video showed off Hammond Robotics, the producer of heavy-weapons mechs. It features heavily-armored, robot-like mechs having success in inflicting great damage on enemy units. The video revealed a new Titan called the Ogre, a mech that is much different from the others we have seen in previous video recording of the game. The Ogre titan class is more shatterproof. Well-known gaming hardware designer Razer is going to try his hands in the iPhone controller market, according to a fresh tweet from distinguished technology leaker @evleaks. Using micro-blogging platform Twitter, @evleaks leaked images of the Razer iPhone game controller dubbed Kazuyo. The reported largely resembles Logitech's PowerShell product. Bungie's next space epic game Destiny will be released in September next year, publisher Activision announced through a press statement. According to the statement, the widely anticipated shared-world shooter Destiny would be released worldwide on 9th of September, 2014. The beta version of the game will be launched in the summer, with Sony's PlayStation 3 and PlayStation 4 game consoles to get the game first.